Cellucor’s C4 Extreme remains one of the most popular pre workouts on the market so it’s only natural that new pre workouts keep coming out trying to encroach on its market share. One such new formidable opponent is Optimum’s Gold Standard Pre Workout. With a shiny gold lid (in keeping with its name) and a quality formulation, Gold Standard Pre Workout is a serious competitor for C4. In this article we take a look at how the two compare on a number of important pre workout domains. There’s a surprising amount of overlap between the ingredients in both products, with just 3 or 4 ingredients that differ between the two . However, of the ingredients that do differ, they are key. Relevant examples include the omission of arginine alpha ketoglutarate in Optimum Gold Standard Pre Workout, the inclusion of creatine monohydrate in the place of creatine nitrate and the inclusion of citrulline malate. While there are other minor differences, they’re not really worth mentioning in the grand scheme of things. In our view, these key ingredient differences are all major pluses in Optimum's favour. Arginine AKG is increasingly recognised as an inferior nutrient (compared with citrulline) for increasing nitric oxide, while there’s no debating the efficacy of creatine monohydrate versus nitrate. As with the ingredients above, there is a lot of similarity when it comes to the respective dosages of ingredients in these two products. Beta-alanine is dosed the same, while the difference in minor ingredients such as b-vitamins, caffeine and tyrosine is minimal (albeit slightly in Gold Standard’s Pre Workout favour). A notable difference is that of creatine, with Optimum’s Gold Standard Pre Workout coming with 3g per serve, versus the 1g of creatine nitrate found in C4. This is the most meaningful difference as far as dosage goes. But with additional ingredients in the form of vitamin D, citrus bioflavonoids, acetyl-l-carnitine, you can’t go past Optimum’s Gold Standard Pre Workout for ingredient dosing. 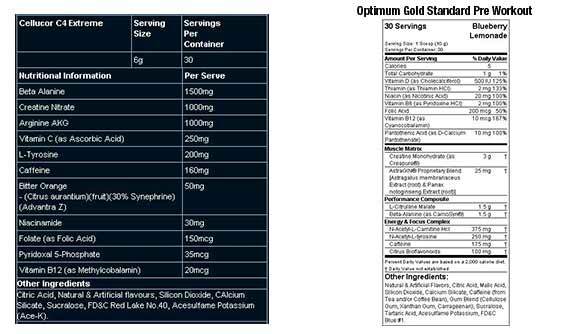 A useful addition to the supplement facts panel on Gold Standard Pre Workout is the 2-scoop column showing the amounts of each ingredient in two serves. These days there’s plenty of people who opt for more aggressive dosing and it’s great to be able to see how much your getting instead of having to do the sums in your head. When you consider the superior ingredient profile and dosages of Optimum’s Gold Standard Pre Workout, it’s hard to go pass it as the most effective of the two. The line up of ingredients in Gold Standard are simply more evidenced based, with the likes of creatine nitrate and arginine AKG being notable ingredients in C4 that have a distinct lack of published studies to support their efficacy for improving performance. C4 Extreme has always been a winner in the taste department with a wide range of flavours; all of which taste pretty darn good. Optimum were obviously cognisant of this when developing their Gold Standard Pre Workout and have done a great job with the limited flavours they developed. But with such an extensive range of flavours offered by C4, we have to give the nod to Cellucor on this one. On a price per gram basis, both supplements work out to be a very similar price, keeping in mind that C4 comes in a small (i.e. 174g) and large (i.e. 350g) size. This means that both pre workout are well priced compared to many others, which should ensure they are within reach for most customers. The notable difference however is that the large sized C4 Extreme offers 60 serves, while Optimum’s Gold Standard only comes in a single 30 serve size; having a larger serving size than C4. Whether this will be a major determining factor in people’s purchasing decisions is hard to say as there are some who simply compare price based on serves per pack, while more savvy supplement users will consider the differences in ingredients and serving size when comparing prices. Overall Winner: Optimum Gold Standard Pre Workout by 3 to 2.